Dexter Graves (1789-1844) was a hotel owner and one of first settlers in the area, bringing a colony of 13 families to Chicago from Ohio in 1831. This bronze figure, 8 feet high and standing against a polished black granite backdrop, was commissioned by Graves’ son, Henry, to mark the site of his father’s burial. 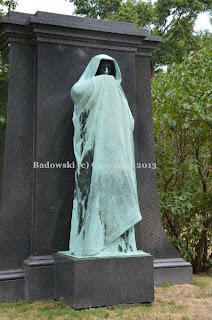 Taft’s approach to the work signals his awareness of innovative funerary art, such as the Adams Memorial by Augustus Saint-Gaudens, installed at Rock Creek Cemetery in Washington, D.C. in 1891. Saint-Gaudens’ piece featured a shrouded figure of ambiguous gender that reflected Henry Adams’ interest in Buddhism and his desire to honor his wife’s memory with a serene figure who has accepted the inevitable. Similarly, Taft’s shrouded figure does not reflect a traditional or Christian approach to a mortuary monument, and the eerie quality of the work may have been enhanced by the fact that the exposed areas have developed a green patina while the face has remained dark.